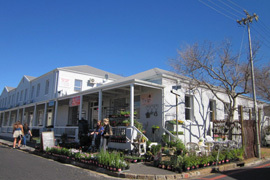 Harfield Village is a quaint Chelsea-esque area situated in the greater Claremont area. 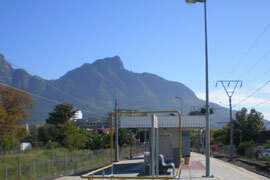 It is bordered by Bell Road, Imam Haron Road (formally known as Lansdowne Road), Rosmead Avenue and the railway line. Its official border is Bell Road on the south side, however many people mistakenly think of Kenilworth Road as the border. The village has just under 1000 residents and the average erf size is about 220 square metres. The majority of properties are Victorian and Edwardian cottages, many semi-detached or terraced and some free standing, that border tree-lined streets. The first cottages built in the area date back to the mid 1880’s. The village has numbered avenues and English sounding street names like Surrey, Norfolk and Suffolk. The cottages make perfect starter homes, and there is a real village feel. This small little stand alone suburb manages to hide itself obscurely on the other side of the railway line and Main Road. The history of the village is marred by the forced removals of residents during the Apartheid’s Group Area Act implementation. You can read more about the history by clicking here. The village is zoned as a special area by the local municipality and houses that are 60 years or older require planning permission from the Heritage Council. The village has maintained its vibrant atmosphere. 2nd Avenue (stretching into Kenilworth) forms the main social hub and thoroughfare boasting as many as 13 restaurants offering a large variety of cuisines. There are 4 parks that are maintained by a committee called ‘Friends of the Parks’. This body forms part of the Harfield Village Association (HVA), recognized by the City of Cape Town as the official representative for the local community. The Association organises an annual carnival in early March each year, drawing in thousands of visitors. 2nd Avenue transforms into a pedestrian walkway, brimming with stalls and allowing restaurants to spill out onto the road. Live music, great food, kiddie fun, crafts and art give testimony to its village appeal and a festive day out is enjoyed by all who visit. Our website is loaded with info, images and a video of this event. Please click here to view more. The village fits snugly up against Harfield station on the major commuter train line into Cape Town, and probably got its name from the original Harfield Cottage, built here by Thomas Mathew, one of the initial residents of Claremont. The station opened in 1931 and is different from other stations on the southern suburbs line as it is the only station with a single island platform in the middle of the up and down rail tracks that is accessible by a subway. Harfield Village is a convenient area for local transport connections with many busses and taxis operating on Iman Haron Rd (AKA Lansdowne Road). For visitors and residents alike Harfield Village is convenient and accessible. It lies right in the heart of the southern suburbs of Cape Town, just down the road from Cavendish Mall, close to popular spots like Villager’s Rugby Club, Kirstenbosch Gardens, Kenilworth Racecourse, Newlands cricket and rugby stadiums, and not even twenty minutes from the airport. It might not be a beach-side suburb, but its pretty views of the mountain more than make up for it. There are 5 churches and 1 mosque in Harfield Village and surrounding area. The oldest church in the village is St Matthew’s on 2nd Avenue. It was founded in 1888. Kenilworth Methodist Church is circa 1890. The Sunni Mahamadan Masjid Mosque in Harvey Road was founded in 1908. St Ignatius Catholic Church in 1934, St James in 1968 and the Church of the Nazarene in 1975. The mosque in Harvey Road is the oldest mosque in the Claremont area. The village is also close to many of the good schools that the southern suburbs is renowned for. Greenfield Girls’ Primary is closest to the village and it’s a quick drive to the Rondebosch schools. There are numerous nursery schools and play groups servicing the starter home community. Nearby Montessori and Waldorf schools include Auburn House Primary, Cedar House and Michael Oak. The majority of cottages sell in the region of 1,5 – 1,9 bar. There is a high demand for property and many buyers are charmed by the area and have to wait in line to secure their dream home. For more info on property click here. A wide variety of local businesses operate in the area, from home industries to retail shops and professional services. You can find a list of all the businesses in the area by clicking here. The village is more than a village – it is a destination. Come and savour what it has to offer, whether taking a bicycle ride around the quaint roads, enjoying a delicious coffee at the coffee shops or coming into the village for a gastronomic feast. There is just so much on offer that it is highly likely your tastes will be catered for. If you find yourself with +/-30 minutes to spare why not download the VoiceMap Audio Tour of Harfield Village and take a walk through this historic village. It is completely FREE of charge as it is sponsored by Norgarb Properties. Annual Harfield Railway Line clean-up.